In light of the boys' terrific win in the MDL, the boye were asked to play at half time in Drogheda. 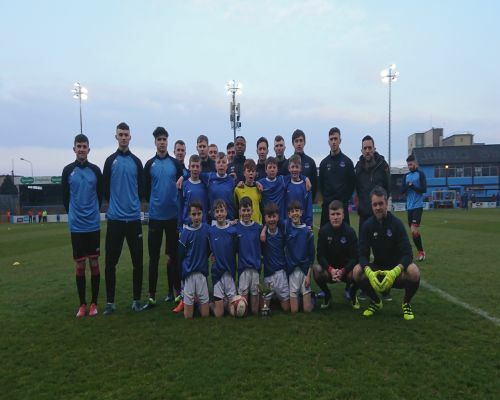 The winning panel, along with James C and Mark, met the players from Drogheda United beforehand and posed for pictures with them. They then posed for a guard of honour before the match and then at half time, played a 5 aside match on the pitch, showing all the skills and touches that made them champions. Well done to all the players on an excellent exhibition and thank you to all the parents who gave up their Fridays to accompany the boys. Thanks also to Paul Holland who organised the exhibition match. A great experience for all! 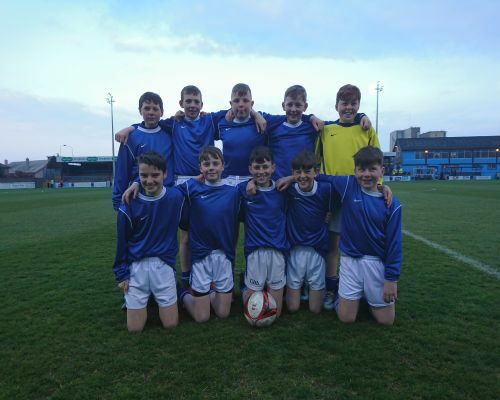 Well done to the boys' soccer team who won the Boys' Section B soccer title in the MDL. 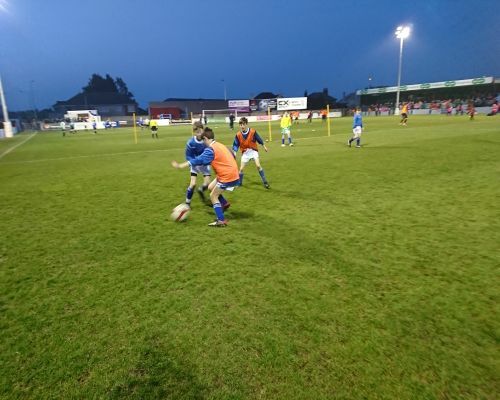 Having qualified for the finals into a group of four, Kildalkey warmed to the task by taking on Wilkinstown. Despite conceding an early goal, Kildalkey settled well and goals from Jamie M helped them into a 5-1 half time lead. Controlling the second half well, they eased to a comfortable 8-2 win to start the competition. The second game proved to be the tightest game of all. Rathbeggan took an early lead and despite intense Kildalkey pressure, held the lead at half time (0-1). A goal from Jamie early in the second half brought Kildalkey back into it – however, a further strike from a free kick saw Rathbeggan lead 2-1 going into the last few minutes. However, a brilliant last minute goal from Thomas saw Kildalkey salvage a 2-2 draw, which would prove to be crucial. Knowing that they needed a win to have any chance of winning, Kildalkey started brightly and raced into a 2-0 lead. Dunboyne pulled back a goal before half time, leaving the score 2-1 at the break. 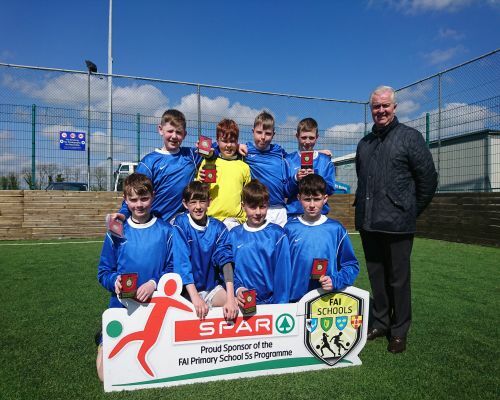 However, Kildalkey upped the gears after half time and further goals from Shay, Aaron, Thomas and Jamie saw them finish 6-2 victors and the overall champions. 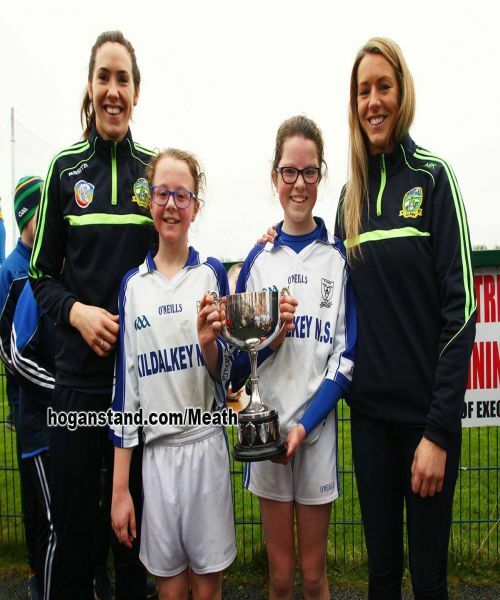 This was a superb victory for Kildalkey, only their second ever at this level. All the squad members contributed hugely on the day. Goalkeeper Jamie Kavanaghwas solid and consistent between the posts whiledefendersConor Barnwell and Shay Digginswere reliable throughout. Aaron Potteron, Conor McNally, Thomas O’Brien-McGee were dominant in midfield and kept possession very well.Strikers Jamie Murray and Caemerhon Smythscored the goals at crucial stages. The boys now go through to the North Leinster finals on the 2nd of May - we know they'll do us proud! 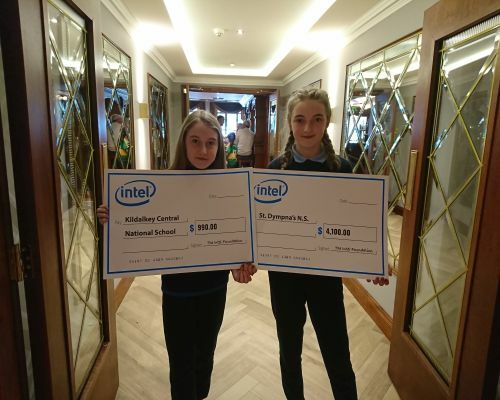 The school recently received grants from Intel, which were awarded at a function in Leixlip. The school received cheques of 910 dollars and 4100 dollars apiece. This is in light of all the volunteer work done by parents working in Intel. Many thanks to all who have contributed and volunteered in the school to contribute to theses grants, and many thanks in particular to Joanne O'Doherty who helped organise it all. The grants will go towards bolstering the ICT resources in the school. 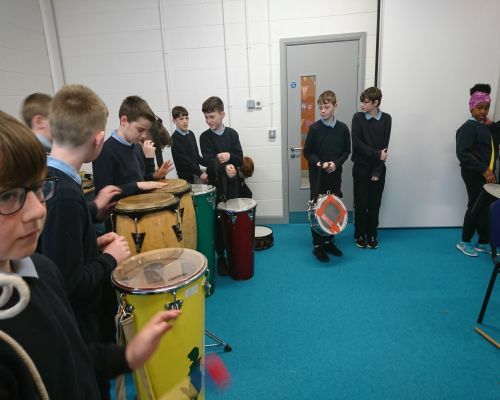 The students of fifth and sixth class recently enjoyed a drumming workshop, courtesy of our local bus driver, Dorian. 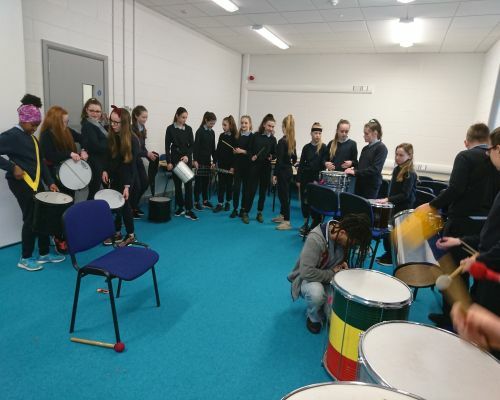 All the students got to see the techniques with all the different drums and all got to play the various different drums, beating out some rhythms. All really enjoyed the experience! Thanks to Dorian for the workshop! 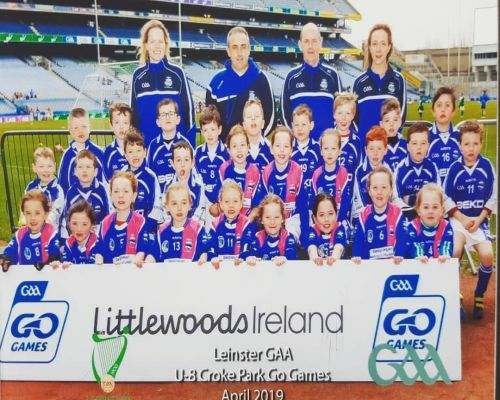 On Sunday, 14th April, GAA players from all over the country participated in Go Games in Croke Park. Among them were many players from Kildalkey! Well done to our star GAA players from Senior Infants and 1st class who took part in the Go Games. All thorougly enjoyed the day! Well done to all who helped coach and organise the day!